Do you have an active dog in your household? Is she driving you nuts with her constant whining to step outside? But the absolute worst feature of Casey is that she needs to go in and out of the house all day long. Out to pee, out to bark, out to snooze under the apple tree's, out to chase squirrels, out to bark at the birds around the bird feeder, out to harass the neighbours dog through the fence, and on and on…. Don't you love your dog? Getting up and down to let the dog out during the summer months is not too bad, as it is in the spring and fall, but as you can see we live in a part of the world that gets a real winter. We'll get temperatures that get into the -30's (and that's Celsius!) so overtime you open up a door to let a dog out, you also let out a blast of warm air out, and it get's replaced by a blast of frigid outside air. Next minute you hear the furnace kick in and you know your gas bill's going to be huge again this month. We have a set of double sliding patio doors coming off our family rooms, and onto the deck that faces our backyard. Most of our time is spent in that family room as it offers a view of our favourite place, the back yard and flower gardens, our bird feeders, hanging baskets, and the apple trees under which we have the grand kid's Winchester Out Door Playhouse set up. 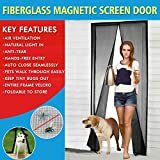 It appeared that if we were going to install any type of "doggie door", that this would be the ideal place to install it, and I set out to research what would be the best type, and how much expertise it would require to install it. I enjoy doing my own home handyman projects so it was important that we find a model that was designed for the average guy, as I really didn't want to have to hire a tradesman. Though not particularly talented in that regard, I can manage fairly simple projects. 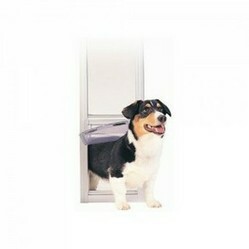 My friend Google game in handy, and a simple search for the term "best patio pet door" bought back lots of options. After an hour or two of reading manufacturers claims and reviews by past purchasers, one model really stood out, the PetSafe Patio Pet Door. Actually I kind of surprised myself as installing the PetSafe Patio Pet Door was nowhere near as difficult as I thought. I dedicated an entire weekend to complete the installation but actually had the entire job completed by Saturday evening. We only had to show Casey how to push the flap to enter and exit it a couple of times, and then she was running through it willy nilly, and all day long. Surprisingly the seals on the door are very well designed, and though a tiny draught is present if the wind is howling outside, the PetSafe model is pretty well sealed, and I'm sure we'll see a big difference in the heating bill this winter. I can't express how much more enjoyable owning a pet has become since installing the PetSafe Patio Pet Door. Why didn't I do this years ago! If you are prone to allergies like rhinitis then having a dog may cause you have an attack of sneezing. Does this mean that you can never have the company of a furry friend?